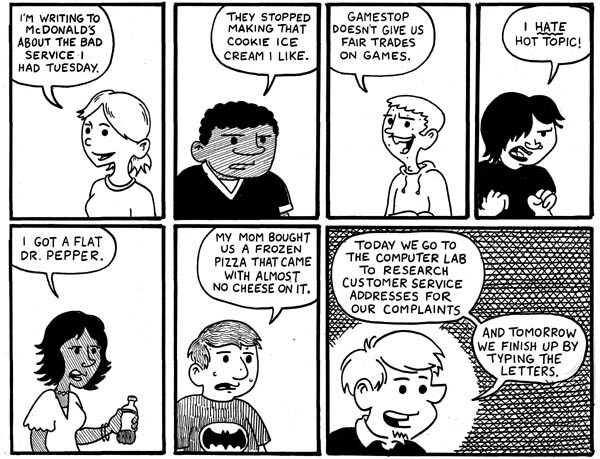 …uh, that’s a sow’s ear I’m holding in the first panel, in case my great artwork has blinded you momentarily. Yep. It sure is. 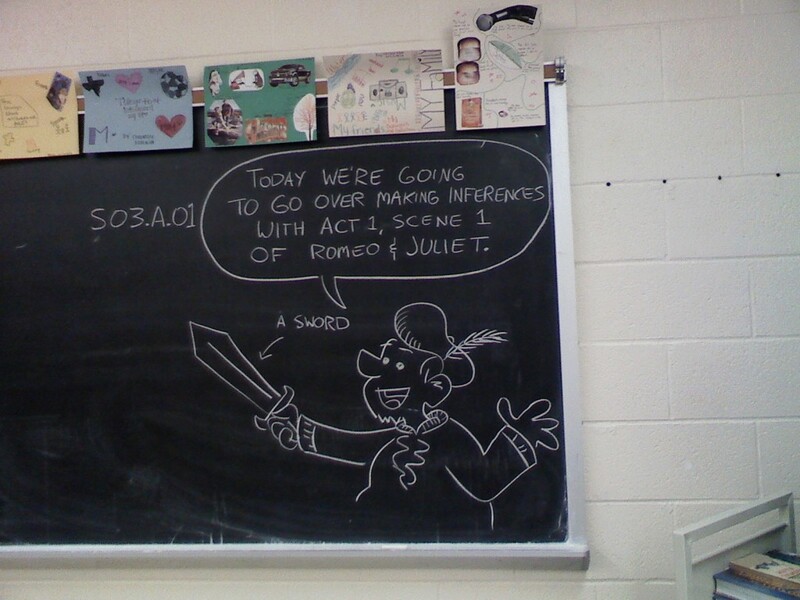 It won’t be reflected in the comic for a week or two, but we’re done with Animal Farm and moving on to “Romeo & Juliet” as of this past week. I don’t like to be crass, but COME ON! The first scene in “Romeo & Juliet” is unbelievably packed with bawdy jokes and, of course, the immortal “bite my thumb at them” exchange. It’s such an amazingly vulgar hook for the kids that I always use it on the first day of reading. 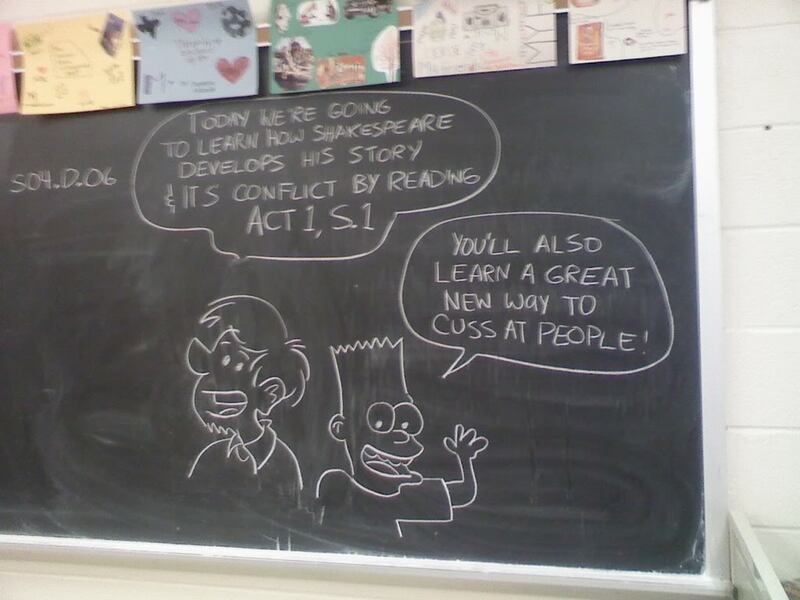 Something I drew wrote five seconds before everyone came in on the day I teach blank verse. Let me just say, I am aware that if you parse out the first line, it’s one syllable long. 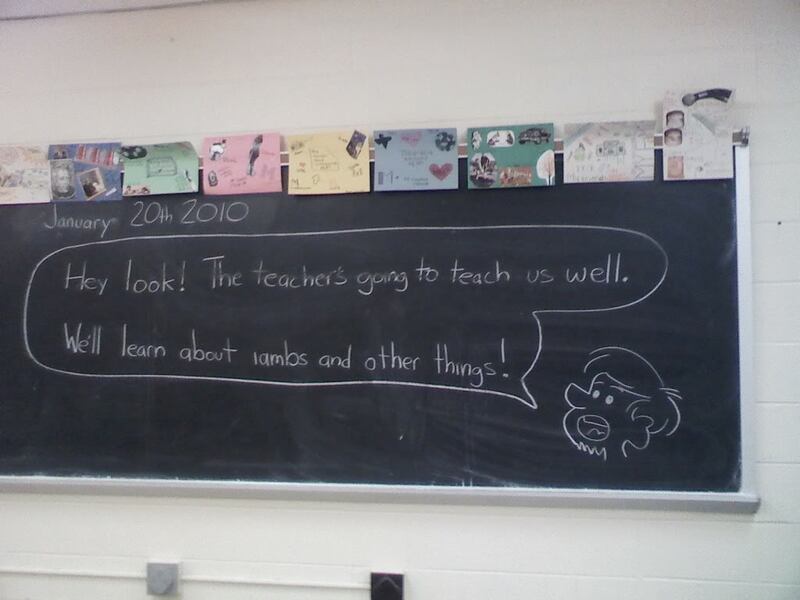 Was I aware of it when I wrote it on the board? Heck no. I just kind of taught around it. day sixty two and a half. I struggled a lot with yesterday’s comic. 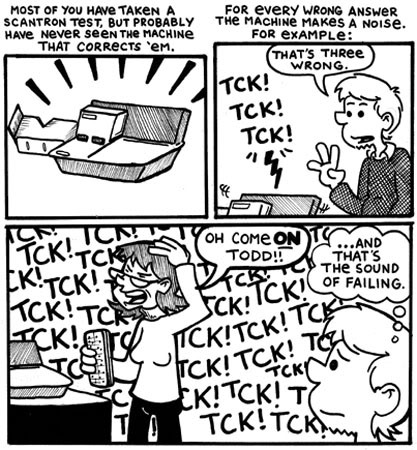 The aim was to draw something about the idea that when you correct a scantron test, it’s immediately obvious how your kids did on the test by the loud noise the machine makes as it corrects their marks. Sometimes you slide a test through the machine and you hear one click and you think “Awesome! Johnny did a good job on this week’s vocabulary test!” Other times you send it through and it sounds like yesterday’s strip. 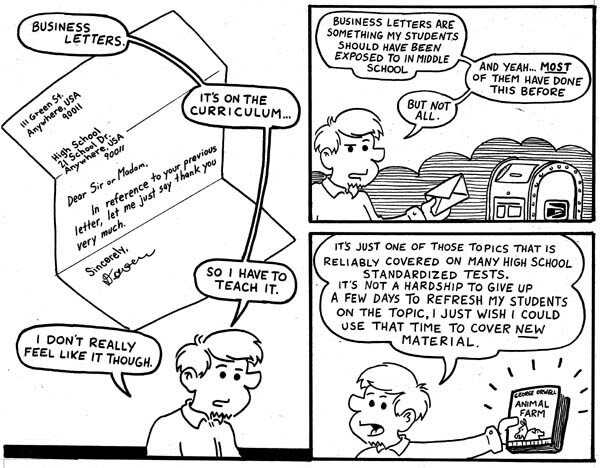 Yesterday’s comic focused on the negative a little too much and it bugged me until I remembered this morning that I actually DID a scantron comic about four or five years back. While I had completely forgotten about it when I drew the more recent of the two strips, you can see I lifted aspects of the old strip whole cloth for the new one. I feel like this is a better representation of what I was trying to communicate with yesterday’s strip, so I thought I’d post this one here for comparison. I think it’s interesting (and sort of sad) that I did a better comic about teaching when I was substituting back in 2004 than I did in 2010 as a teacher with five years experience. 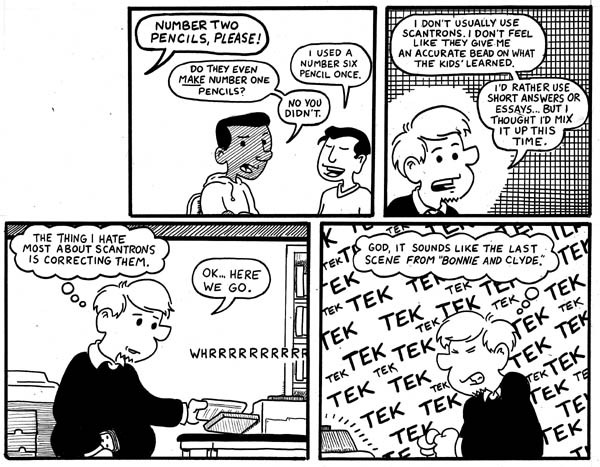 Just to be clear, scantrons are FINE for taking a quick pulse of the class… but they’re better used in say, a math class. You are currently browsing the Teachable Moments blog archives for January, 2010.